Donald Kleingarn, 85, Wahpeton, ND, passed away Wednesday, February 13, 2013 at St. Catherine's Living Center, Wahpeton. The Funeral Service will be Saturday, 3 PM, at Vertin-Munson Funeral Home, Wahpeton. There will be visitation one hour before service at the funeral home on Saturday. Interment will be at a later date. Vertin-Munson Funeral Home is in charge of arrangements. Military Honors will be conducted by Wahpeton Military Honors and ND Military Funeral Honors. Don was born on March 7, 1927 to Hans and Frieda (Wohler) Kleingarn in Cayuga, ND. He graduated from Milnor High School in Milnor, ND. 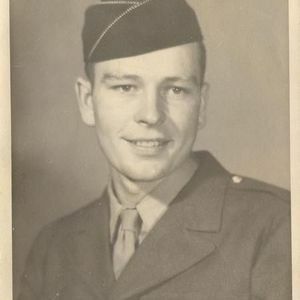 He served in the Army for one year between World War II and the Korean War, after which he attended telegraph school in Minneapolis. Upon graduating, he began working at the Great Northern Railroad and finished his career at the Burlington Northern Santa Fe Railroad in 1987. Don loved a good joke, enjoyed singing, was quick to smile and laugh, and was beloved by his family and friends. He will be greatly missed. Don is survived by sons David Kleingarn (Lisa) and Duane Kleingarn (Sallie), stepdaughter Joanne Funfar and stepsons Lee Haring (Glenda), Charles Haring (Madelyn), and Greg Haring (Merlyn), grandchildren Tom (Julia), Mary, John, Benny, Alexa, Kara and Duane Jr., as well as many step-grandchildren, nieces, nephews and friends. Don was preceded in death by his parents Hans and Frieda Kleingarn, his wife, Marion Kleingarn, brothers Russell and Ivan Kleingarn, sister Mildred Owens, and stepdaughter Marlys Kadoun . In lieu of flowers, memorials can be directed to the American Legion or the VFW. Don rented a room at our home in breck for many years. He drove me and all my stuff to moorhead state when i entered the college as a freshman. He was a very nice man. Don will be missed whether its strolling the block or cruising in his El Camino. We feel really blessed to have gotten to know him. We looked forward to every fall when I would get to pick those delicious apples from his backyard and I think Don loved it even more when we would return the favor with an apple pie! My condolences go out to Don's family. Don and Marion were good friends at the Vet's Club. Don's laugh will be missed on the community. Condolences to you all. Don, may there be a winning casino for you up there. I Hope that you and Virg can get together and relive your good days on earth. You might even get a free haircut from him. Tell him he is missed. You were a great guy, and we will miss you. Thanks for being so good to Aunt Gladys. Hope to see you in about 30. To Don's Family- You have my deepest sympathy. My mom and dad,Ray and Ferne Cimbura, were very good friends with Don and Marion. We spent a lot of good times with them. I always looked forward to talking with Don when I would go to the Vets with my mom. He was such a fun guy and seemed to love having a good time. He will definitely be missed! You are in my thoughts and prayers. Condolences to all of Don's family. I will truly miss my cousin and so glad we were able to touch base in the past few years. Always lots of laughs. Also, many fun and happy memories of our early years.